London’s Hyde Park is a venue of historical significance for The Rolling Stones. On July 5, 1969, the Stones played a free concert there for an estimated half-million fans. It was their first concert following the tragic death of founding member Brian Jones (July 3, 1969) and also the debut of new guitarist Mick Taylor. 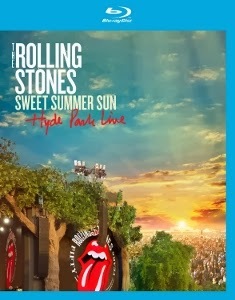 That’s not the concert found on Eagle Rock Entertainment’s new Sweet Summer Sun – Hyde Park Live Blu-ray. On July 6 and 13, 2013, 44 years after the original show, the Stones returned to Hyde Park for another massive concert. That two-hour-plus show is presented in terrific high definition video and audio on the new release. The set list is a predictable assortment of big hits and classic album tracks. The recent single “Doom and Gloom” is the only surprise. Luckily it’s a hard-edged rocker that sounds great in a stadium setting, even if it’s a bit outclassed in the presence of so many classics. Mick Jagger struts and preens as usual, remaining in strong voice for the duration. Ron Wood and Keith Richards play off each other like the comfortable pros they are. The rhythm section of founding drummer Charlie Watts and longtime touring bassist Darryl Jones anchors the proceedings as surely as ever. Jones’ bass solo on “Miss You” is his shining moment. In an appropriate nod to the original 1969 concert, Mick Taylor guests on two tunes, most notably adding sizzling leads to a show-stopping “Midnight Rambler.” He returns to join the band on acoustic guitar for the final encore of “Satisfaction.” Richards steps up to the mic for “Happy” and the more obscure Let it Bleed track “You Got the Silver.” It’s all very tasteful, professional, and above all fun. But it’s also a bit lacking in real surprises or genuine excitement. It’s probably unfair to expect a sense of freshness from a band that’s been out there for so long, though it’s worth mentioning that Eagle Rock has released some far more valuable Stones concert videos in recent years (including Ladies and Gentleman… The Rolling Stones, filmed in 1972, and Some Girls: Live in Texas ‘78). Note: A three-disc version of Sweet Summer Sun – containing one DVD and two audio CDs – is also available. For the truly committed, there’s a box set version containing the 2013 concert on Blu-ray and DVD, the two audio CDs, AND the original 1969 concert on DVD.